The Fralin Museum of Art at the University of Virginia has accessioned Henry's 1973 series, Prosody Drawings, a delicate series of resin emulsion on plexiglass boxes. The thick emulsion records only the scansion marks ( ̆) and (/) of the poems referred to in the title. In prosody/landscape, Henry records the visual scene outside his window in terms of scansion marks, translating a visual image into the elements of poetic analysis. The viscosity of the emulsion meant that scissors were needed to cut it, and so like contour drawing, all the movements of artist’s the hand are recorded on the plexiglass. By putting the media behind the support surface, Henry worked to break down the divide between background and foreground, media and support. 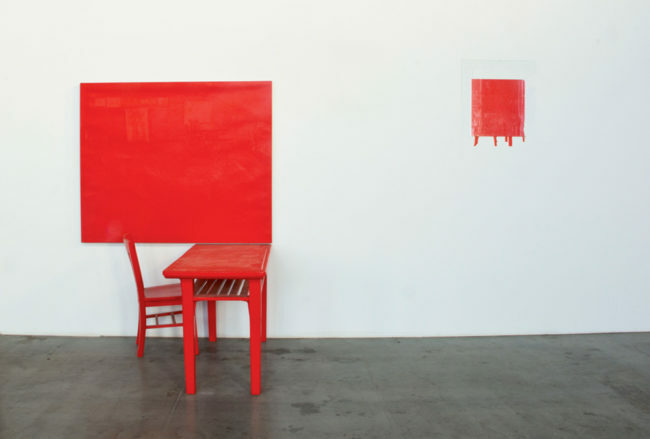 Two large-scale installations in the 1978 Interiors series, Cadmium-Vermillion (Barium) Red, Medium – Studio, and Pure Cadmium Red, Medium – Bath, have gone to the Brooklyn Museum and the Cleveland Museum of Art, respectively. The Sammlung Hoffmann collection, in Berlin, acquired three paintings from Henry's seminal 1971 body of work, Wet Grounds.